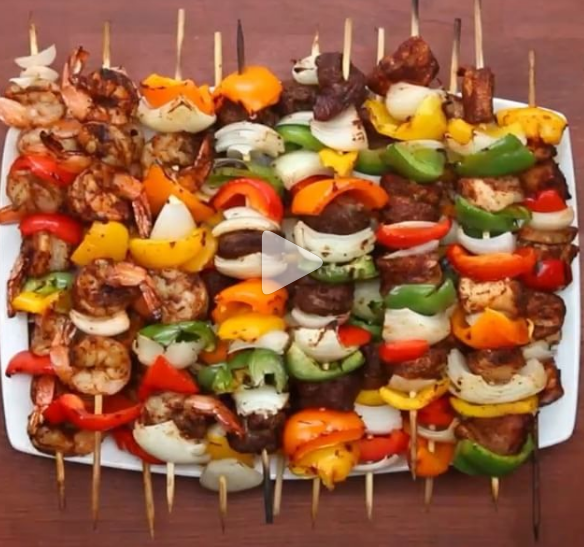 GRILLED FAJITA SKEWERS Serves 12-14 INGREDIENTS 1 to 2 onions, quartered 6 bell peppers, cut in 1.5” squares 1 pound cubed steak 1 pound cubed chicken breast 1 pound shrimp, deveined and peeled with the tail on 3 teaspoons salt (1 teaspoon per protein) 3 teaspoons pepper (1 teaspoon per protein) 3 tablespoons garlic powder (1 tablespoon per protein) 3 tablespoons chili powder (1 tablespoon per protein) 3 teaspoons cumin (1 teaspoon per protein) PREPARATION 1. Place each meat in a gallon sized plastic bag and cover with dry ingredients. Close the bag and shake until evenly coated. 2. Prepare skewers by layering onion, bell pepper, and protein. (Be sure not to mix proteins on the same skewer, as they have different cook times.) 3. Grill the skewers over medium-high heat, flipping once, until the protein’s internal temperatures are as follows: a) Steak – 155ºF/70ºC b) Chicken – 165ºF/75ºC c) Shrimp – 145ºF/65ºC 4. Enjoy!